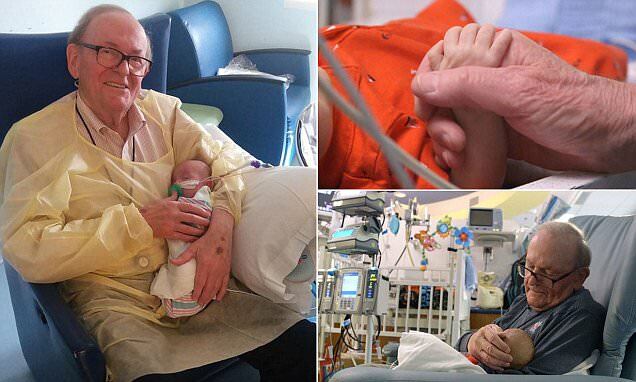 Some babies need a little more extra attention when they're first born and one kind-hearted retiree, christened the 'ICU Grandpa' is proving that he's just the man for the job. David Deutchman, 82, earned himself the nickname - as well as the moniker 'Fairy Godfather' - after volunteering at the Children's Healthcare of Atlanta, where he has been happily helping out in the pediatric and neonatal ICUs for 12 years, offering care and support to preemie babies - and their parents - as best he can. On Tuesdays, David visits the PICU to hold babies whose parents can't be with them. and on Thursdays, he makes rounds in the NICU to share some words of kindness with families, according to a Facebook post from the hospital. In their post, David can be seen holding Logan, a premature baby born at just 25 weeks, smiling and cradling the tiny infant. Logan has been in the hospital for six weeks and every night, Logan's mom goes back home to be with Logan's big sister but on one particular morning when she returned to the hospital, she was met by the 'ICU Grandpa'. Logan's mom fought back tears but managed to capture the heartwarming moment in a photo that has since gotten more than 200,000 likes.